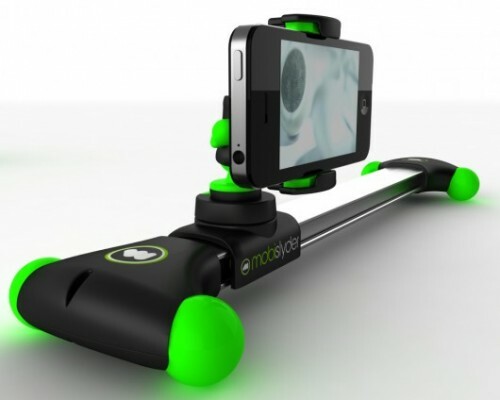 Mobislyder Puts Your Video Shots On Rails | OhGizmo! Megapixels count for almost nothing when looking at video quality. First is the lens quality, but perhaps even as important is tracking shot stability. We talked about the CineSkates a while back. That accessory to the Gorillapod put your camera on wheels and opened up cinematic possibilities. Same goes for the Mobislyder, a 43 cm (1.4ft) track with 5 interchangeable mounts and a slider on roller bearings. The ends of the track are covered in rubber feet which help with grip on tilted surfaces, and a switch on the sliding mechanism lets you lock it in place should you need to. Sliding is done by hand so clearly some practice will be needed, but at least the camera is stabilized on two axes. You can pre-order now for $129, while full retail price should be around $175. Shipping should happen on December 12th.